The Iowa Agricultural College newspaper "The Aurora" was published monthly by the students for the four literary societies on campus (The Philomathean (1868); The Bachelor (1870); the Cliolians (1870) and the Crescent (1870)). The cost of a year's subscription was $1.00 and a single issue cost $.15. The Aurora contains essays, reviews, and musings relating to culture, reading, and science, as well as local notes relating to alumni, the campus, and student activities and life. Representative issues in this collection are from the years 1874-1893. 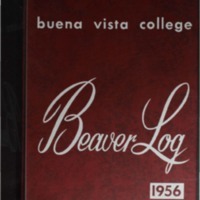 Buena Vista College (which became Buena Vista University in 1995) was founded by the Presbyterian Church (USA) in 1891. The first college building, known as “Old Main,” was opened in 1892 and was the primary building on campus until it was destroyed by fire in 1956. The college was first granted accreditation by the North Central Association of Colleges and Secondary Schools in 1952.Over time, the campus has grown from four buildings in a small area to nearly two dozen buildings which cover a handful blocks along the shores of Storm Lake. Today, there are 16 locations across the state of Iowa as well as an online program for expanded learning opportunities. Coe College is a private, four-year co-educational liberal arts college that was founded in 1851 in Cedar Rapids, Iowa. "Coe College Student Humor" is a digital compilation of resources housed in the collections of Stewart Memorial Library's George T. Henry College Archives. At present, the Student Humor compilation focuses on a series of student-produced broadsides announcing the arrival of Flunk Day, a campus skip day that has been an annual occurrence since 1911. Much to the dismay of college officials, broadsides announcing that first event were clandestinely distributed at a chapel service, and the bulk of the student body subsequently abandoned campus for a day of leisure. Although a number of the Flunk Day broadsides are no longer extant, those that survive illustrate the changing nature of undergraduate humor. 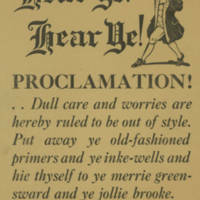 The last known Flunk Day broadside dates from the mid-1970s. Brian Duffy was born on May 9, 1955 in Chicago, Illinois. He studied at the University of Wisconsin-Milwaukee and the Milwaukee Institute of Art and Design. Duffy began his career at the Des Moines Register in 1983, where his cartoons quickly became popular and his work earned multiple awards. Duffy’s career at the Register ended abruptly in 2008 when his position was terminated by the company during budget cutbacks. Today, Duffy remains in the Des Moines area and continues to produce artwork on his own and through a local news station. Pulitzer Prize winner Jay Norwood 'Ding' Darling created editorial cartoons for the Des Moines Register throughout the first half of the 20th century. Cowles Library's extensive collection of Ding Darling artist proofs has been digitized and is presented here online. 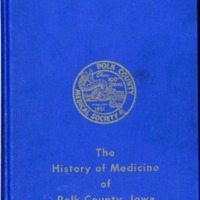 This book was written in celebration of the first one hundred years of the Polk County Medical Society in Des Moines, Iowa. It is a chronicle of the historical development of the practice of medicine from 1842-1951. 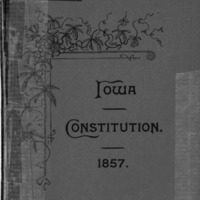 The original 1857 Iowa Constitution had been housed in a glass case for all to see in the Iowa Secretary of State's Office in the Capitol Building for many years. In August of 2014, this document was carefully scanned by the archivist at Iowa Library Services in the Miller Building located on the Iowa Capitol complex.